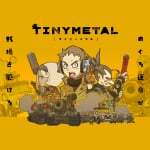 Tiny Metal may have been delayed, but it's still on track to become - potentially - a viable option for Advance Wars and Switch fans around the globe. The latest news regarding the Sony-published title has not been the best, but this week the director of the game invited famous Japanese video game director and scenario writer Yoko Taro to share a play session and some opinions about Tiny Metal. The surreal result is below. We have to admit it is one of the most honest opinions we've seen in a video of this nature. To endorse or not a whole game with such a short five minute session is not easy, but we expected nothing less than straight answers from the director of Nier: Automata. That's a title, by the way, that we would not mind seeing on the Switch. Regular person by day, super video game player by night, Gonçalo lives in eager anticipation that the prophecy of a new F-Zero will soon be fulfilled. When not messing about making weird music he can be found with a Super Nintendo pad in hand, replaying a Japanese wrestling game no one has ever heard of. Korosensei what da hell happened to you? What a strange video. If you want someones opinion on a game, let them play it for longer than 5 minutes, and within that context, don't lead off with what they thought of the games story. Well by all means, bring it over. My wallet is ready. @Folkloner It's a joke, dude, relax. They obviously wanted to make a little parody of the usual "preview" videos of people that go to E3(example) and after 10 minutes they already say: AWESOME, GAME OF THE YEAR! I'm not too big on Nier but this guy is pretty funny. As for the game though, very much looking forward to it, just like that other indie Advance Wars look-a-like. I'm just glad someone it trying to fill the void left by AW. "That's a title, by the way, that we would not mind seeing on the Switch." Yup! Switch is lacking games in that genre. Maybe a Bayonetta re-release is in order....all I know is that we need P* games on NS. What's that on his head? I'd love to see the original Nier come to Switch! Porting Automata would be quite a challenge as it was designed for PS4 and XboneX. (I just realized if you fully abreviated X Box One X, it would be XBOX) I'd love to see it, but there would have to be a lot of concessions to make that work well. I have it on PC, so maybe just play it when RainAway comes out! Haha. As for this video: I like how Yoko Taro was basically "I don't know. I played it for five minutes. Seems good? I guess?" But of course the first thing he picked up was the merciless slaughter of hundreds of human lives. That's the kind of thing he would notice. He's gone on record as stating Drakkengard was designed partially to make a statement on the wonton killing of Dynasty Warrior type games. @Nicolai It's the mask of one of the prominent Nier characters. He has a thing about being shown in public videos/interviews; He once did an entire interview with a sock puppet from behind a podium. Taro is awesome and Nier Automata is incredible! @Nicolai haha. I read that it was that he thinks his opinions and game designs aren't worth talking to people about (not as a self deprecation thing, but more talking baseball with somebody who doesn't care how baseball works). It's still weird, no doubt! But I appreciate his commitment to the bit. @DrRandle That's still a shame that he doesn't think we're worth the time to share his insight. Also, "talking baseball" is mostly what jumped out at me, and yes, he does look like a talking baseball. @DrRandle I only just picked up Nier Automata a couple weeks ago. I don't see anything there so intensive that the Switch couldn't run it without some pretty easy downgrades. At least early on most of the environments don't have much going on and the geometry is fairly simple. Some places where there are a lot of machines on screen can just have taxing effects like motion blur kicked back. @Nicolai He's said in the past, that's because it would be "boring" for final users, so he doesn't want to bore us; it's not because he thinks people don't deserve to know about that. Really need to pick up Nier Automata on PS4. That said... Im so getting this game on my Switch. I think they should port Nier Replicant Japanese version with English patched subtitles to the Switch. That and all the Drakengard games. I kept cracking up every time he prefaced something by repeating: "...I've only played it for 5 minutes." What a total weirdo! And I do mean that in the most flattering sense possible. I really do enjoy a proper eccentric. Once I whittle down my PS4 backlog, I really need to nab a copy of Nier: Automata. @Nicolai personally I don’t see the guy as being someone who is lacking in care for others. I think it’s quite obvious he has some confidence issues and maybe he doesn’t think he is worthy of sharing his opinion (even though he clearly is worthy). But just because of his position, I don’t think that means we should guilt trip him into sharing knowledge with us because if he doesn’t it shows “he doesn't think we're worth the time“. Sorry if this sounds like some kind of in-depth evaluation of your comment, but I personally like individuals like this guy and think we should allow him to be his unique, semi-crazy, baseball-look-a-like self without putting any expectations on him. Having said all that, however, the video above is clearly all just a scripted joke. NiER Automata is not as resources intensive game as some people believe. I think there wouldn't be any trouble porting it to Switch with the required adjustments. I, personally, would be ecstatic is that were to happen. @Kienda Well, yeah, I agree with that. He of course doesn't owe us anything. Maybe I read @DrRandle's comment incorrectly. @Nicolai Hmm... well reading @DrRandle‘s comment again, maybe I misunderstand this guy. @Kienda @Nicolai - Just to clarify, the point about it was not wanting to 'bore' end-users, because most average folks probably don't care how a game comes together. The fact that we're on a website dedicated to video games on a regular basis probably leaves us as the exception, who WOULD like to hear more. It's definitely not meant to be arrogance, he's just trying to be considerate. I think he views the mask as a way of 'entertaining' people, while retaining his modest opinions. @DrRandle thanks for that. I appreciate the clarification. Lol, something different for once (I mean the video). And quality of life features, too!